PICK UP OR SHIP IT! Visit one of our local showrooms today! 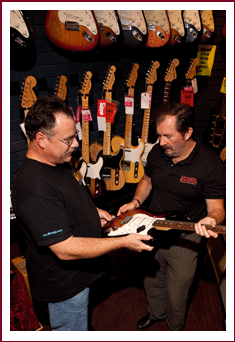 At instrumental music we believe buying a guitar is a highly personal, emotional and physical experience. You can't really evaluate how the guitar will interact with your hands and body from a picture on a website. While the web may be a great starting point to learn about your favorite Fender guitar or amp there is no substitute for sitting in one of our comfortable showrooms and playing a large number of guitars. Our website displays a fraction of the Fender guitars, basses and amps we have available at any one of our three showrooms. If you are considering any guitar or amp purchase we highly recommend first visit one of our stores and experience for yourself the feel playability and tonality of the instrument. Plug in a Fender and test it out! The guitar is a purchase that may last a lifetime don't take a chance on buying something sight unseen. In addition to guaranteed best prices instrumental music also offers in-store service and adjustments as well as a friendly and knowledgeable staff to make your guitar buying experience fun and memorable.